Prove 100% compliant to Supreme Court's guidelines of safety & security. DT Cinemas, the multiplex chain, has been announced as 100 per cent compliant to the Supreme Court’s guidelines of Safety & Security at Cinemas post ‘Uphaar’ tragedy. The multiplex has taken steps to ensure safety. Firstly, an audio-visual is always played before and during the interval of each movie screened educating the patrons on safety exits and ‘what to do?’ in case of fire and emergency exits with complete audi layout. Secondly, they have ensured that every auditorium, at any given point of time, has a security warden positioned in case of any emergency. Anant Verma, Director & Business Head, DT Cinemas said, “It is our constant endeavor to transfer best cinematic experiences to our patrons through all our cinemas. For this reason, a patron’s safety & security tops our priority list. 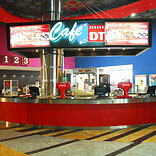 With 100 % compliance to Honourable Supreme Court’s guidelines of Safety & Security, excellent F&B options, warm hospitable staff, latest sound and projection technologies and push back chairs for extra leg room, DT Cinemas is a preferred destination for all cine lovers”.